Yesterday’s Tomorrow starts with an intriguing premise and gets even better. 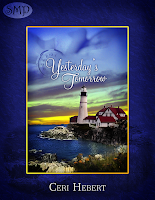 Langston Hughes wrote a poem that asks, “What happens to a dream deferred?” Ceri Hebert answers it in her very satisfying short story, Yesterday’s Tomorrow. Do you remember “do overs” as a kid? At forty-four, Lila Weidner gets one. I love what she does with her “do over”, and I’m willing to bet you will, too. This story is not only immensely satisfying, but it gets stuck in your brain because it gets you to think—way more than those “Freaky Friday” shows ever did. Lila has to decide what she’s going to do if she doesn’t go back to her old life, and equally important, what she’s going to do if she does. This book is about dreams, those realized and those deferred. It’s about choices and claiming the right to be happy. It’s about settling and about risking everything. It’s about joy and love. I loved this story. I loved how it made me think of Langston Hughes’ poem “A Dream Deferred.” But mostly, I loved how it made me look at my life and think what I’d do differently, and more importantly, what I can do now to achieve those dreams deferred. Quite a lot to accomplish in forty-six short pages, but Ceri Hebert manages it quite nicely. Good job, Ms. Hebert. I hope you’ll get this short story and that you enjoy it as much as I did.